Heat oven to 350°. Grease bottom only of rectangular pan, 13x9x2 inches. Heat 1/2 cup of the chocolate chips and the butter in heavy 1-quart saucepan over low heat, stirring occasionally, until melted. Mix baking mix, sugar, vanilla, eggs and chocolate mixture; spread in pan. Bake 15 minutes. 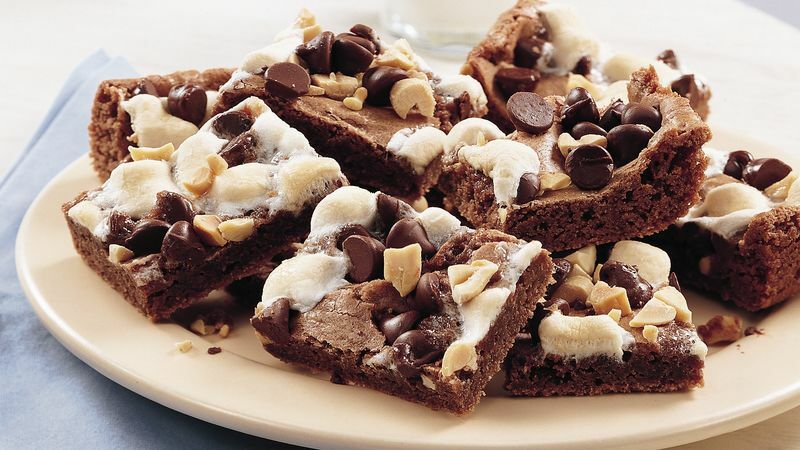 Sprinkle with marshmallows, nuts and remaining 1/2 cup chocolate chips. Bake 10 to 15 minutes or until marshmallows are light brown. Cool completely. Cut into about 2-inch squares.